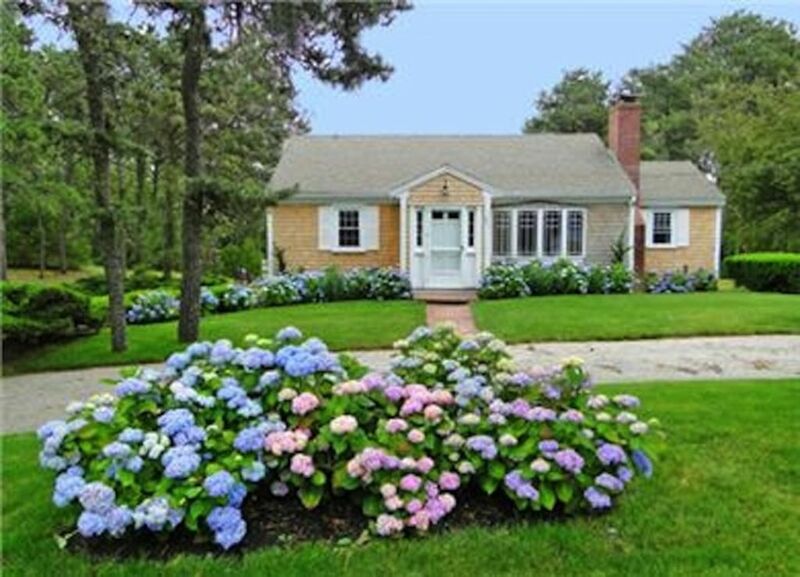 After walking by the beautiful hydrangeas and entering through the front door you will realize this house is much more spacious than it looks from the outside. You enter the comfortable living room with the adjoining dining area and you look into the very spacious fire-placed family room with a 32 square foot picture window overlooking the large back yard bordered by trees. This room also has a table for dining with a pass through window from the kitchen and a desk for those needing to keep up with things at the office. The black and white eat in kitchen has an Electrolux wall oven, a brand new Bosch dishwasher, a Jennaire ceramic cook top, a Keurig coffee maker as well as a drip coffee maker, granite counter tops and recessed lights. There are two bedrooms and a full bath (tub with shower) on this level. All floors on this level are oak except for the kitchen and bath which are ceramic tile. As you proceed downstairs to the walk out lower level the washer dryer will be on your left. To the right will be three twin beds which are a perfect set up for children. This room shares a closet with the other bedroom on this floor. The fourth bedroom has a queen bed, a flat screen TV, a full bath (no tub) and its own private entrance if desired. Great for the in-laws, babysitter or a second couple. The house can be very comfortable for a single family, the extended family or two families. My family has stayed here under all three scenarios and always had a great time. The large back yard has lawn furniture, a picnic bench for 8, a gas grill and an enclosed outside shower. The yard is big enough for whiffle ball, croquet, or whatever else you may like to play and is not at all close to any roads. Ridgevale Beach (very family friendly) is a quick walk down the road (or you can drive, there is parking). This makes a nice after dinner stroll as well. Please note the house has central air throughout for your added comfort. The Chatham Bike Trail which connects to the Cape Cod Rail Trail is less than a mile away. Marian's Pie Shop is also an easy walk and her cinnamon rolls are legendary. The center of downtown Chatham is about 3.5 miles and can be reached via the bike trail if so desired. Movie theater, library, band concert, summer baseball league, great restaurants, golf, tennis and pickle ball. seven eight one four three nine nine zero eight five. Ridgevale Beach is very special for the way its tidal stream forms a virtual moat around the beach proper. That stream creates a great stretch of sandy beach with no waves where younger children can enjoy the sand and water without the surf. Older kids can have a ball riding inflatables, going with the flow of the incoming and outgoing tide. Truly Mother Nature's Water Park. Chatham Village is a short 5 to 10 minute drive where you'll find great shoppes, restaurants, and galleries. Enjoy the quaint movie house or band concerts on the green. And don't forget to hit one of the many ice cream parlors in town too! NOTE BENE: Rental rates do not include the newly enacted legislation for a 12.45% short term rental tax for rental dates occurring on or after July 1, 2019. This will be collected from the tenant. <BR><B>Amenities:</B><BR>Microwave, coffee makers, washer, dryer, wireless internet access, gas grill, central air conditioning, DVD players, picnic bench, lawn furniture, large landscaped lot. The ever popular Ridgevale family beach is at the end of the street-10 minute walk. Very nice cottage that had everything we needed for a great family vacation in Chatham. House seemed larger than the pictures showed and there was plenty of room for 3 couples and the kids. The owner Paul was friendly and attentive and in fact called to say we could check in early when house keepers were ahead of schedule. We took several walks down to Ridgevale beach through out the week, sometimes in the morning and other times just before sunset. Great place to relax and enjoy Chatham! Would definitely stay their again. I did a lot of research on where to stay for our visit to Cape Cod. We are a married couple and had 3 adult children with us. This house was perfect for us! It is close to so much, yet felt very private and on a wonderful little street that was not busy. A short walk to a beautiful beach and a short walk in the opposite direction to a wonderful pie shop! This house is close to Chatham, which we just loved that little town! The owner made everything very easy for us, and he was very responsive during the booking process. Lots of wonderful tips right by the back door. There are plenty of bed options and the beds were VERY comfortable. We loved playing games at the game table in the back living room. We were very happy with this house and it's location!! House was big. The family room was our favorite. Large windows., sunny, comfortable seating and a nice table for four. We spent most of our time there. The owner was. Sry responsive when I emailed with questions. It was nice to have 2 bedrooms. The kitchen was well appointed. Will come back again . Great house in a great location--can't be beat. We have been staying at this home every September for the past 14 years. Every year an enhancement has been made to the property. The proximity to Ridgevale Beach (10 minute walk) is a real plus. Further, about a half mile from Marian's Pie Shop and her famous cinnamon rolls and other great desserts. Just a tad further than that is the bike trail from which you can explore so much. Chatham is centrally located halfway between Sagamore Bridge and Provincetown so it's easy to go to the National Seashore as well as Cape Cod Bay. But with Nantucket Sound at the end of the street, there is almost no need to go to the other beaches. The house is always immaculate and well maintained, the backyard is large and the area is quiet. I highly recommend this for your visit to Chatham. This is a delightful cottage in a great spot on Cape Cod. It is not really walking distance to any town (although there's a delicious pie shop a few minutes away). But it's a 10 minute walk to a beautiful beach! It's also right in the centre of the Cape, so nothing is too far. We explored Hyannis, Yarmouth, Harwich, Orleans, Provincetown and Chatham in the one week stay. The cottage itself is a little dated but very comfortable spacious and clean. The third bedroom and second bathroom is in the basement but it looks out onto the very ample backyard. The eat-in kitchen is perfectly usable and there are plenty of pots and pans and dishes and glasses, etc. There are two living room areas (a sitting area and a TV area), as well as a dining room (which we did not use). Sheets and towels are not included and have to be rented separately, so take that into account when considering the price. However there are ample beach chairs, umbrellas, boogie boards, etc. This was a huge convenience as we threw them in the car and took them to the different beaches we explored. The owner (Paul) was a total pleasure to deal with and even offered some recommendations about what to do. He stopped by at one point to return our security deposit personally. We would completely recommend this place to anyone looking for a reasonable rental on Cape Cod. It's more rustic rather than shiny and new. But as long as you understand what you are getting you will have a great time. There were no surprises during our recent stay....everything was just as we anticipated. The home was sparkling clean when we arrived and we found the main floor to be bright and spacious. The downstairs area is a little tighter but the space is ample. I would stay there again without question. We had a great time. Located in the very popular Ridgevale Beach area of West Chatham. Awesome family location. Be sure to read the reviews. This house sells out every summer and there are only 4 in-season weeks left. $1,495-$2,995 per week A refundable security deposit, a cleaning fee and a pet fee if applicable are required. Currently there is no sales or occupancy tax due on renting a private home. Personal check is the preferred form of payment. In the event of cancellation the tenant is responsible for all rents due under the lease. If the premises are able to be re-rented all rents paid will be refunded less a 15% (of all rents due) cancellation fee.